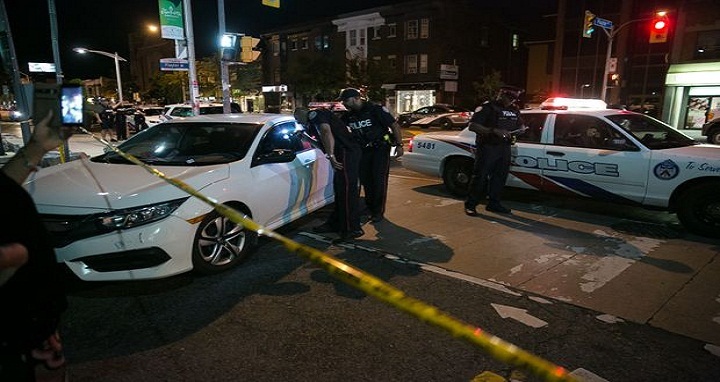 Dhaka, 23 July, Abnews: A woman was killed and 13 others injured in a shooting in Toronto on Sunday night, Police Chief Mark Saunders said. The shooting victims are being treated for their injuries and their conditions were not immediately known. But one of the victims — a young girl — is in critical condition, Saunders told reporters late Sunday. Shots rang out shortly after 10 p.m. ET in the Toronto’s Greektown neighborhood. It’s not clear what motivated the shooter, police said. They’re investigating “every possible motive, including terrorism,” Saunders said. The shooter, who had a handgun, died from an apparent gunshot wound, but it’s not clear if it was self-inflicted or as a result of exchanging gunfire with police, Saunders told reporters. Local resident Andrew Van Eek told CNN partner CBC that he looked out his window after hearing gunshots. Van Eek described the suspect as a white male aged in his early to late thirties and wearing black clothing. Another witness, Jody Steinhauer had been dining with her family at Christina’s, a Greek restaurant, when she heard what she thought was the sound of firecrackers. Then she was told to run to the back of the restaurant. “We started to hear people scream out front,” Steinhauer told CBC. “We have a gun problem in that guns are readily available to too many people,” he said. On Friday, the city rolled out a program to put 200 more officers on the streets of at-risk neighborhoods between 7 p.m. and 3 a.m. to combat gang violence, according to CTV. It’s not clear if Greektown was included in that program. Reporting the announcement of the program earlier this month, CTV reported that by July 8 there had been more than 200 shootings in Toronto and 26 fatalities. It said that by the same time the previous year there had been 188 shootings — resulting in 17 deaths. In total, CAN $15 million ($11.4 million) had been set aside for efforts at curbing gun violence in Toronto, with some money going to community programs aimed at stopping youth joining gangs, CTV quoted Tory as saying. However, an unnamed witness on Sunday expressed shock that Greektown had been the location of a shooting. “It’s the street where families come. They were all out tonight walking, having their dinner … it’s just unbelievable in this neighborhood,” they said. The Greektown Business Improvement Association says the area — also known informally as “The Danforth” for its Danforth Avenue location — is North America’s largest Greek neighborhood. According to the 2016 Census, Greek was the second most commonly spoken language at home — behind English — in the Toronto-Danworth city ward that contains Greektown. Six percent of the ward’s immigrant population was Greek-born.